Rivera, who is baseball's all-time saves leader, will be headed to Cooperstown with fellow MLBers Mike Mussina, Edgar Martinez and the late Roy Halladay. It was especially painful being a Boston Red Sox fan in the late 1990s and early 2000s. I can trace that feeling back to my senior year of high school in Saratoga Springs and the four years I spent at college in New London, CT. There was the whole we-hadn’t-won-a-World-Series-since-1918 thing hanging over our heads. There was the indubitable fact that our arch-rivals, the New York Yankees, were next to unstoppable, playing some of the best baseball in the history of the game. And there was the seemingly patchwork group of random, twilight-of-their-career players that the Yankees’ management would sign in the offseason, who’d end up doing superhuman things (example: David Cone’s perfect game). The worst part of that stretch, though? 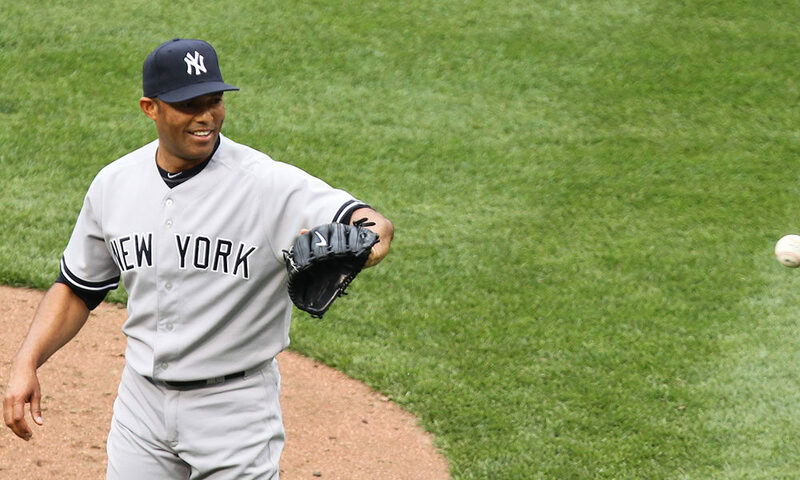 Having to watch many of my favorite players face Yankees closer Mariano Rivera. He would stride out to the mound to Metallica’s “Enter Sandman,” maybe the most epic walk-on song of all time, and then simply decimate anything with a bat and a heartbeat. He’d do it like it was just another day in the office, with no fanfare or angry stare-downs or limp arms hanging (à la the Sox’s current closer, Craig Kimbrel). He made it all look so easy. Maybe the single greatest day in this Red Sox fan’s career, between the years 1997 and 2004, when the Sox finally won their first World Series in 86 years, was the 2001 championship, when the Arizona Diamondbacks’ Luis Gonzalez hit a walk-off, bases-loaded single off of Rivera to hand the closer and his team a rare loss. I remember being in college at the time, in a second-floor single, and opening my window up and cheering loudly out of it. Others followed. (After all, we were in Connecticut, deep in Sox Country). That moment, at least for a split second, it felt like Rivera was fallible. But those instances were few and far between, and when Rivera finally retired in 2013, I’m pretty sure Red Sox Nation—and the rest of the batters in baseball—breathed a collective sigh of relief. The hell was finally over. Now, as of January 22, that hell Rivera unleashed has punched him a one-way ticket to baseball heaven and history books. Yesterday, Rivera became the first-ever player to be unanimously elected into the National Baseball Hall of Fame in Cooperstown. Or, to those keeping track, that means he appeared on all 425 ballots cast by the Baseball Writers’ Association of America members who can vote Hall of Famers in. Rivera will be inducted during this July’s induction weekend festivities, which take over Downtown Cooperstown and take place July 19-22. He’ll be enshrined along with fellow pitcher Mike Mussina, a Yankee teammate of Rivera’s at one point, who also starred for the Baltimore Orioles; Seattle Mariners’ designated-hitter/third baseman, Edgar Martinez; and the late Roy Halladay, who was one of the modern-era’s most dominant starting pitchers, who split a career between the Toronto Blue Jays and the Philadelphia Phillies (Halladay was killed in a plane crash in 2017). The quartet of newly inducted Hall of Famers will join the two elected this past December, relief pitcher Lee Smith, who starred for the Chicago Cubs and St. Louis Cardinals, among a panoply of other teams; and designated-hitter/outfielder Harold Baines, who starred for a number of teams throughout his career, including the Chicago White Sox and Orioles. Additionally, Al Helfer, who called early World Series and All-Star games in the ’30s and ’40s, will be posthumously awarded the Ford C. Frick Award for broadcasting; and journalist Jayson Stark, who currently writes about baseball for The Athletic, will be awarded the J.G. Taylor Spink Award for writing (you might also recognize him from his turn on ESPN, where he worked until 2017). For those baseball fans crying the blues that their guy didn’t make it in, here’s a short list of those that got the most votes but fell short: Curt Schilling, Roger Clemens, Barry Bonds, Larry Walker and Fred McGriff—basically, your entire baseball card collection from the mid ’80s/early ’90s. McGriff, who was in his last year of eligibility on the ballot, will have to wait until 2021 to even be considered for enshrinement again.